Greetings again from the darkness. Director Lenny Abrahamson’s follow up to his stellar film ROOM (Oscar nominated for Best Picture and Best Director) is based on Sarah Waters graphic novel, and adapted for the screen by Lucinda Coxon (THE DANISH GIRL). Very early on, the film succeeds in giving viewers that “I have a bad feeling” sensation … usually a very good sign for films in this genre. 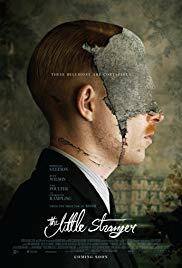 The always excellent Domhnall Gleeson stars as Faraday, the local town doctor called out to check on the lone remaining housekeeper at Hundreds Hall. For a couple hundred years, it’s been the Ayres family home, and though, in its past, a glorious fixture among Britain’s elite, the home, grounds and family themselves are all now little more than a distant memory of their once great selves. When he was a mere lad, Faraday’s mum had served on staff, and his memories of the grand palace are jolted by the sight of its current dilapidated state. The Ayres family now consists of Charlotte Rampling as the matriarch who has yet to move past the death of her beloved daughter Susan so many years ago; Will Poulter as Roderick, the son who was disfigured and maimed during the war; and Ruth Wilson as surviving daughter Caroline, who seems to have surrendered any semblance of life in order to care for her mother, brother, and home … each in various stages of ill-repair. This is a strange family who mostly keep to themselves, well, except for Faraday who seems drawn to the family … or is it the house? Even his romantic interest in Caroline could be seen as an excuse to regularly return to the house. His flashbacks to childhood and a festival held on the estate grounds provide glimpses of his connection, but with Gleeson’s mostly reserved façade, we never really know what’s going on in his head. Part haunted house, part ghost story, and part psychological thriller; however, it’s really not fully any of these. There seems to be a missing link – something for us to grab hold of as viewers. The film is wonderfully cloaked in dread and looks fabulous – replete with ominous music and a creepy old mansion. Unfortunately those things are accompanied by the slowest build up in cinematic history. “A snail’s pace” is too kind as a description. The film is very well acted, but horror films and thrillers need more than atmosphere, otherwise frustration sets in with the viewer. There is little doubt this played much better on the pages of Ms. Waters’ book. This entry was posted on Friday, August 31st, 2018 at 5:05 pm and is filed under Musical, Thriller. You can follow any responses to this entry through the RSS 2.0 feed. You can leave a response, or trackback from your own site.